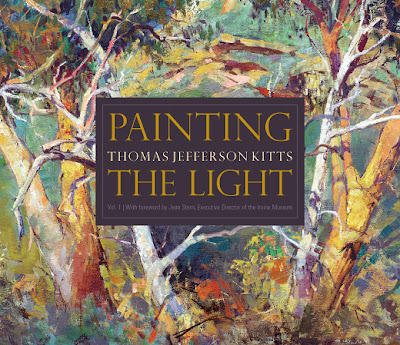 This beautifully designed 110 page book conveniently brings together 100 of my paintings drawn from a time span of thirty years, with a kind and thoughtful foreword by Jean Stern, Art Historian and Executive Director of the California Irvine Museum. For those who are curious about my early days of painting en plein air – which began in back 1984 before anyone knew what to call it – you will find some examples here. And there is a lot of work between then and now. Facebookers, click here to see the preview. Putting this book together was a labor of love. And a lesson on how to look back at thirty years of pushing paint around while on the move. Over that time I have taken countless side trips into (often) conflicting painting territories; from Cézanne to Sargent, to the Hudson River School, the American Impressionists, the Russian Itinerants, to Velasquez, Sorolla, and Zorn; and lately, the original California Impressionists. And that's just to name a few. But throughout it all there has been one thread that has connected every digression. From art school on, painting and drawing from life has remained crucial. Because direct observation is the touchstone I use to identify what is precious to me. I've wanted to share the history of my work for a long time. I intend to produce two more volumes over the next couple of years so this one won't be the end of it. But for now I hope Painting the Light will help inspire those who follow or collect my work – old or new alike. 8.25 x 10 inches,110 pages, with 100 beautiful full-color paintings. Currently in hardcover. Soon in eBook format.